Samadhi is a Sanskrit word you may see a lot in Buddhist literature, but it isn't always explained. Further, you can find diverse teachings about samadhi in many Asian traditions, including Hinduism, Sikhism, and Jainism, as well as Buddhism, which can add to the confusion. What is samadhi in Buddhism? The root words of samadhi, sam-a-dha, mean "to bring together." Samadhi has sometimes translated "concentration," but it is a particular concentration. It is "single-pointedness of mind," or concentrating the mind on a single sensation or thought-object to the point of absorption. The late John Daido Loori Roshi, a Soto Zen teacher, said, "Samadhi is a state of consciousness that lies beyond waking, dreaming, or deep sleep. It's a slowing down of our mental activity through single-pointed concentration." In deepest samadhi, absorption is so complete that all sense of "self" disappears, and subject and object are completely absorbed into each other. However, there are many kinds and levels of samadhi. Samadhi is associated with the dhyanas (Sanskrit) or jhanas (Pali), usually translated "meditation" or "contemplation." In the Samadhanga Sutta of the Pali Tipitika (Anguttara Nikaya 5.28), the historical Buddha described four basic levels of dhyana. In the first dhyana, "direct thought" cultivates a great rapture that fills the person in meditation. When thoughts are stilled the person enters the second dhyana, still filled with rapture. The rapture fades in the third dhyana and is replaced by deep satisfaction, calm, and alertness. In the fourth dhyana, all that remains is pure, bright awareness. Especially in Theravada Buddhism, the word samadhi is associated with the dhyanas and the states of concentration that bring about the dhyanas. Note that in Buddhist literature you can find accounts of many levels of meditation and concentration, and your meditation experience may follow a different course from the one outlined in the four dhyanas. And that's all right. Samadhi also is associated with the Right Concentration part of the Eightfold Path and with dhyana paramita, the perfection of meditation. This is the fifth of the Mahayana Six Perfections. Over the centuries, Buddhist meditation masters have charted many subtle levels of samadhi. Some teachers describe samadhi in the three realms of ancient Buddhist cosmology: desire, form, and no form. For example, being completely absorbed in winning a game is samadhi in the realm of desire. Well-trained athletes can become so absorbed in a competition that they temporarily forget "I," and nothing else exists but the game. This is a kind of mundane samadhi, not spiritual. Samadhi in the realm of form is a strong focus on the present moment, without distraction or attachment, but with a lingering awareness of oneself. When the "I" disappears, this is samadhi in the realm of no form. Some teachers divide these levels into more subtle sub-levels. "In absolute samadhi, in complete falling away of body and mind, there is no reflection and no recollection. In a sense, there is no 'experience' because there is a complete merging of subject and object, or a perfect recognition of already existing non-separation. There is no way of describing what is or was going on." The guidance of a teacher is highly recommended. Buddhist meditation practices open the door to countless experiences, but not all of those experiences are spiritually skillful. It's also very common for solo practitioners to believe they have reached a deep meditative state when in fact they have barely scratched the surface. They may feel the rapture of the first dhyana, for example, and assume that's enlightenment. A good teacher will guide your meditative technique and keep you from sticking anywhere. The various schools of Buddhism approach meditation in different ways, and in at least two traditions sitting meditation has been replaced by focused chanting. Samadhi usually is reached through a practice of silent, seated meditation, however, practiced consistently over a period of time. Don't expect samadhi on your first meditation retreat. Most Buddhist meditative traditions do not say that samadhi is the same thing as enlightenment. It is more like opening a door to enlightenment. Some teachers do not believe it to be absolutely necessary, in fact. The late Shunryu Suzuki Roshi, a founder of the San Francisco Zen Center, cautioned his students not to be fixated on samadhi. He once said in a talk, "If you practice zazen to, you know, attain various samadhi, that is a kind of sightseeing practice, you know." It might be said that samadhi loosens the grip of projected reality; it shows us that the world we normally perceive isn't as "real" as we think it is. It also quiets the mind and clarifies mental processes. The Theravadin teacher Ajahn Chah said, "When right samadhi has been developed, wisdom has the chance to arise at all times." 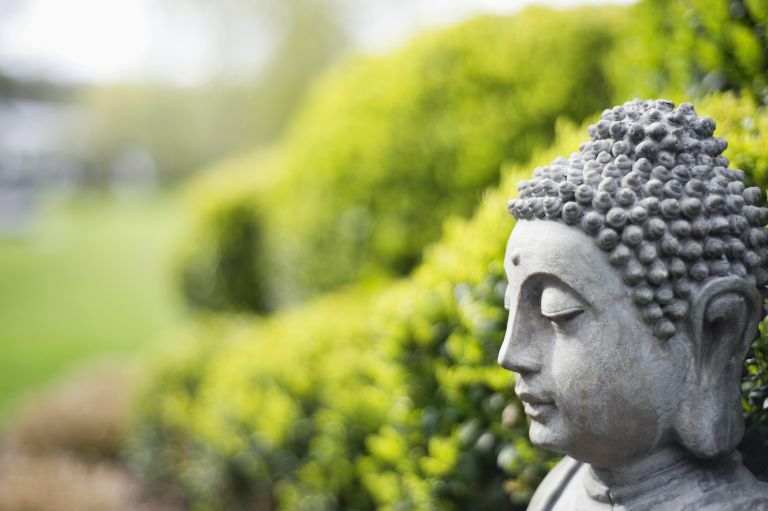 What Does Prajna or Panna Mean in Buddhist Scripture?